This track teaches you how to set up and use Learning alive Plus. This lesson includes 5 videos that teach you how to set up Learning alive Plus. This lesson includes 9 videos that teach you how to use Letters alive Plus. This lesson includes 11 videos that teach you how to use Math alive. This track teaches you how to set up and use Letters alive Plus. This lesson includes 4 videos that teach you how to set up Letters alive Plus. This track teaches you how to set up and use Math alive. This lesson includes 1 video that teaches you how to set up Math alive. 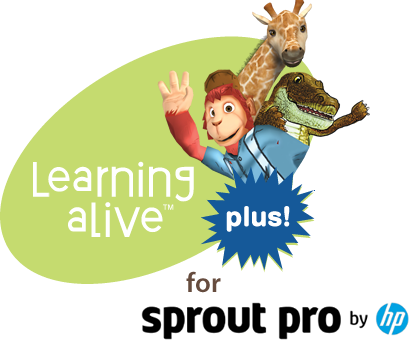 This track teaches you how to set up and use Learning alive Plus for Sprout Pro by HP. This lesson includes 8 videos that teach you how to set up Learning alive for Sprout. This lesson includes 10 videos that teach you how to use Letters alive for Sprout. This lesson includes 8 videos that teach you how to use Math alive for Sprout. This lesson includes 1 video that teach you how to use Interactive Stories for Sprout.